I consider myself an exegete. 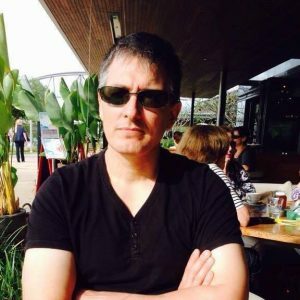 For seven or so years last decade during my dual degrees at Malyon College–a Baptist seminary in Brisbane, Australia–I developed a passion for biblical hermeneutics and exegesis that remains with me today.1 In this article the term hermeneutics refers to those principles one employs when interpreting and applying a text. 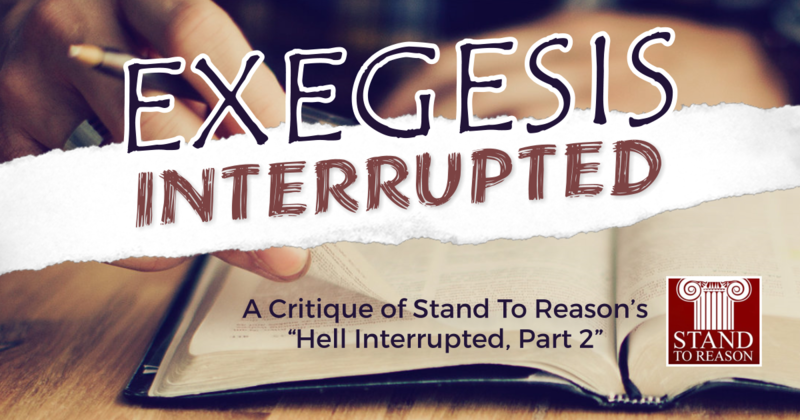 Exegesis is the process of applying hermeneutical principles to properly read meaning out of a text. Eisegesis is the hermeneutical sin of reading meaning into a text. At the start of each semester, I would make sure I could fit every single exegetical subject into my schedule. I became capable enough in this area to be employed by the college as their first study skills tutor, a role in which I was responsible for teaching new students hermeneutical and exegetical principles. I point all this out simply to show that I am in a position to recognize when these principles may be incorrectly applied, or not even applied at all. Exegesis is the reason I became a conditionalist.2 For an excellent article underpinning my understanding of conditionalism and annihilationism see Peter Grice “‘Conditional Immortality’—What it means and why it’s the best label,” http://www.rethinkinghell.com/about/conditional-immortality. Note also I follow the definition of “annihilationism” as expressed in his article. I was persuaded that this view of hell has far more exegetical support than either traditionalism or universalism can muster. I do not mean to imply that proponents of those views never use sound exegesis, or that conditionalists never err in this area. But I did discover that the case for conditionalism conforms to hermeneutical principles much better than the alternative views. My interest was seriously piqued when I discovered that Tim Barnett and Greg Koukl (B&K) of the ministry Stand to Reason had published an article on conditionalism’s hermeneutical principles.3 https://www.str.org/solidgroundnovember2017hellinterruptedpart2 I loved that they had drawn from a lengthy technical book on hermeneutics by William Klein, Craig Blomberg, and Robert Hubbard.4 William W. Klein, Craig L. Blomberg, and Robert L. Hubbard, Introduction to Biblical Interpretation, 3rd Ed. (Grand Rapids: Zondervan, 2017), 264. This was one of my college textbooks, and I sat exams designed to gauge how well I understood its principles of hermeneutics. The book remains one of my favorite references on the subject, and I genuinely looked forward to a decent discussion of these principles in the context of the hell debate. So, what did I think of B&K’s handling of hermeneutics? Firstly, they do well to emphasize the core hermeneutical principle that “[E]ach statement must be understood according to its natural meaning in the literary context in which it occurs.” This is indeed the most important hermeneutical principle, since without it we will err in our exegesis of any text. Its importance can be seen in B&K’s second interpretive principle, “The correct interpretation of Scripture is the meaning required by the normal meaning of the words in the context in which they occur.” Words very often do have a range of meaning and it is only by examining the usage of each word in each context that we can be sure that we understand them properly. So far, B&K and I are of one accord. Fist pumps for everyone! I will be blunt. If we were to apply this qualification to the first interpretive rule, we would be led into eisegesis. As Klein et al. warn in their textbook, today we are situated at great distances from the contexts of the original audiences of the Bible.5 Ibid., 53-59. Chronological distance means that we are not naturally acquainted with the cultures, geographies, and languages of the biblical contexts. This makes interpreting texts according to “common sense” problematic, because our own cultural cues for what makes good sense to us may be quite different from those of the original biblical milieu. Therefore, broader contextual studies are vital for properly understanding what would have constituted the “plain” or “common” sense within the original contexts. These should address things like genre, literary devices, rhetoric, tone, normal usage of words and phrases, and cultural background. Such studies go hand in hand with the principle of interpreting texts in their immediate literary contexts, to ensure that we are not reading meaning into the texts.6 Even then, there are times when words are rare, hapax legomenon (occurring once), or statements are obscure. We simply do not always have enough detail to know exactly what the meaning is in these cases. I still scratch my head over what Paul means by “because of the angels” in 1 Corinthians 11:10. They give us knowledge of what would have been the “plain sense” for the original audiences, while exegeting texts in their immediate literary contexts ensures we are able to filter out unnecessary information, thus avoiding reading too much into or too little out of these passages. This is especially relevant when we can see how biblical authors typically use words, phrases, and themes throughout their own literature, because we can often gain a very good picture of what constituted “plain sense” for them. While it is true that Klein et al. accentuate the importance of locating a passage in context, they do so with the recognition that the broader the context, the more accuracy is gained by the interpreter.7 Klein et al, Introduction to Biblical Interpretation, 299-300. They even go on to delineate how interpreting passages in context necessarily involves locating them not just in their immediate contexts, but also in all broader contexts such as the full work itself (epistle, gospel), the author’s entire corpus, the testament to which it belongs, and the Bible as a whole.8 Ibid., 300-312. Later in their book they discuss the merits and methodology of conducting word studies, which likewise necessitates accounting for how words are used in the entire biblical document, within a corpus (e.g. the Pauline epistles or the Synoptic gospels), in each testament, and in the Bible as a whole.9 Ibid., 332-344. If an author uses a word, imagery or phrase in a particular manner with a particular meaning throughout their work, then in any given case we can be assured of this usual meaning unless there is a compelling contextual reason to indicate otherwise. All of this is to say that a good deal of effort must be expended to ensure that texts are being understood correctly. Since such exegetical groundwork can be quite extensive, scholars tend to summarize their findings in print, rather than include all of their research into the contexts of each verse they cite. This is what we find with the essays on hell by Clark Pinnock and John Stott, who are two annihilationists that B&K critique in their article. But since B&K are rather selective in their quoting of these two scholars the false impression is given that Pinnock and Stott’s arguments lack any exegetical foundation. If you read both of their essays, you will find that in summarizing their findings, they both provide some clear exegetical reasons for their conclusions. Pinnock’s appeal to the destruction language in the New Testament is accompanied by consideration of “fire” imagery that clearly supports his argument. When he cites Matthew 10:28 he references the picture of dry wood or chaff being completely consumed by fire (Matt 3:10, 12), as a way of informing the reader that Pinnock was allowing Matthew’s own usage of these terms and images to inform him of the meaning of the destruction language.10 Clark H. Pinnock, “The Destruction of the Finally Impenitent”, in Rethinking Hell: Readings in Evangelical Conditionalism, Kindle ed. (Eugene, Origen: Cascade Books, 2014), Kindle locations 1572-1575. Stott also bases his argument on how destruction language is generally used in the New Testament and how this language is employed by specific authors. For instance, he notes that ἀπόλλυμι (apollymi, “to destroy”) normally means “to kill” when it is active and transitive, and he gives examples of how Matthew follows this usage throughout his Gospel.11 John Stott, “Judgement and Hell”, in Rethinking Hell: Readings in Evangelical Conditionalism, Kindle ed. (Eugene, Origen: Cascade Books, 2014), Kindle location 1314 . See also Glenn Andrew Peoples’ article on the Rethinking Hell website for confirmation of this point, http://www.rethinkinghell.com/2012/10/the-meaning-of-apollumi-in-the-synoptic-gospels. Stott then relates this to the key verse of Matthew 10:28 where “those who kill the body and cannot kill the soul” is juxtaposed with “the One who can destroy both soul and body in hell.” He concludes:12 Stott, “Judgement and Hell”, Kindle locations 1318-1319. If to kill is to deprive the body of life, hell would seem to be the deprivation of both physical and spiritual life, that is, an extinction of being. Stott’s method was to establish a normal sense of ἀπόλλυμι when used in a specific way and pay attention to how that word is used in the specific context in Matthew 10:28. This is exactly the method of exegeting texts taught by Gordon Fee13 Gordon Fee, New Testament Exegesis: A Handbook for Students and Pastors, 3rd ed., Kindle ed. (Westminster John Knox Press: Louisville, Kentucky, 2002), Kindle locations 1846-1905., and since there is no contextual reason to indicate that another shade of meaning of ἀπόλλυμι is in view in Matthew 10:28, Stott’s conclusion must be considered sound. B&K also critique Fudge through reference to a single quote found in John Wenham’s own defense of Conditional Immortality.14 “The Case for Conditional Immortality”, in Rethinking Hell: Readings in Evangelical Conditionalism, edited by Christopher Date, Greg Stump and Joshua Anderson, Kindle ed. (Cascade Books, Eugene, Origen), 79. As it turns out, this quote comes from a brief document by Fudge in which he summarizes his main arguments from his work The Fire That Consumes.15 Edward Fudge, “A Loving Challenge to the Evangelical Church”, in Resurrection, Vol. 93, No. 4, 1990; The Fire That Consumes: A Biblical and Historical Study of the Doctrine of Final Punishment, 3rd ed. Kindle ed. (Eugene, Origen: Cascade Books, 2011). Irrespective of whether one agrees with Fudge’s conclusions on hell it should be recognized by everyone that his book is overtly an attempt to trace the larger themes in the Bible while discussing each text in context. I therefore find B&Ks lack of engagement with it mystifying and lament that in doing so they have falsely given the impression that Fudge has not given clear exegetical reasons he understood the biblical language of destruction to support annihilation. The irony is that when B&K aim to show that conditionalist scholars commit the hermeneutical error of reading texts out of context, they do so by quoting Pinnock, Stott and Fudge out of context. A similar problem is evident in the way traditionalists typically engage with conditionalists over the more general question of the destruction language in the Bible. When conditionalists point to biblical destruction terminology to contend that sinners will not suffer forever in hell, traditionalists often respond by pointing out that this vocabulary has a range of meaning so does not necessarily mean “annihilation.” B&K use a variation of this argument, following D. A. Carson’s contention that the key words for destruction can mean “waste,” “ruin,” or “loss of fruitfulness.” For B&K the mere possibility that the key words can mean something other than “annihilation” is enough to say that such language “is not synonymous with nonexistence.”16 For a similar argument see Douglas J. Moo. “Paul on Hell”, in Hell Under Fire: Modern Scholarship Reinvents Eternal Punishment, Kindle ed. (Grand Rapids: Zondervan, 2007), Kindle locations 2240-2479. Unfortunately, they simply ignore the exegetical reasons given by Fudge, Stott, and Pinnock for their understanding of this terminology. The parallelism here turns on the idea that what humans can do only in part, God can do completely. To the conditionalist this indicates that “to kill” and “to destroy” are functionally equivalent, so that both verbs denote the ending of life. There is good contextual reason to think that this is exactly what Jesus intended. According to sound hermeneutics we must locate the text in its immediate context, so it can be understood in relation to the flow of thought in the surrounding passage. To be sure, Matthew 10:28 is one of several short statements made by Christ (Matt. 10:24-33) to encourage his representatives to remain faithful in the face of persecution as they fulfill the mission of spreading the Gospel (Matt. 9:35-10:42). However, in the flow of thought in chapter 10, Jesus has already specified the kinds of dangers they would face (Matt 10:17-18). Notice that Jesus gives them the reassurance they need for those experiences right then and there (c.f. vs 19-20). He then tells them that they will face death through the betrayal of their own families (v 21). The interesting thing here is that Jesus does not offer them reassurance at that point in the same way as he does in verses 17-20. Here they are just told that endurance is the way to salvation (v 22). This leaves the disciples in a position where they know that they will receive specific assistance for some of their suffering but not when it comes to the prospect of death. That distinguishes the issues of suffering and death, and regarding the prospect of their death at the hands of persecutors, the disciples have been left hanging without any promise of assistance. That outstanding concern is what Matthew 10:28 is addressing. Furthermore, when the verb for “to destroy” (ἀπόλλυμι) is used of one person destroying another person in the synoptic Gospels it always means “to kill” (e.g., Matt. 2:13; 12:14; 21:41; 27:20; Mark 3:6; 9: 22; Luke 6:9), so we can see that Jesus was employing ἀπόλλυμι with its usual and plain sense of killing. In doing so he speaks directly to that unresolved concern in the narrative where the disciples had not been given reassurance that God would act to prevent their deaths at the hands of their persecutors. This reading of Matthew 10:28 follows B&K’s first two principles precisely, and very clearly derives from the text itself. Nevertheless, when I have explained this exegesis to some traditionalists I have been accused of reading meaning into the text, or even inventing my own exegesis to support my preconceived theology. They often cannot even conceive of how being killed by God in Gehenna could support the conditionalist case, assuming that the debate has ended as they follow B&K’s line of argument that ἀπόλλυμι does not mean “to annihilate.” But they should at least be able to admit that when a person is killed on this earth the remaining corpse, having been deprived of life, no longer has the capacity of consciousness and will decompose. This idea of life and consciousness being taken away from people is just what the normal meaning of “to kill” denotes, whether in English or in Greek. So it is the same when God destroys people in Gehenna. I do not wish to be misunderstood here; I am not arguing against dualism or asserting that the human soul will somehow decompose too. I am simply saying that the way ἀπόλλυμι is being used in Matthew 10:28 is the same as the way it’s normally used when it means “to kill,” which denotes the complete deprivation of life from the one killed, and therefore Matthew’s audience would naturally have understood this to include associated faculties such as consciousness. To be sure, in the larger scheme those sent to Gehenna will be completely destroyed (c.f. Matthew 3:11-12; 13:40-42) but the emphasis in Matthew 10:28 is on the complete deprivation of life. To the traditionalist way of thinking, however, if ἀπόλλυμι could mean “to ruin” then there is a way of explaining how one can be destroyed or killed without implying the complete loss of life and consciousness. The traditionalist explanation is that “to ruin” signifies “functional ruination”17 So J. I. Packer, “Universalism: Will Everyone Ultimately Be Saved?”, in Hell Under Fire: Modern Scholarship Reinvents Eternal Punishment, Kindle ed. (Grand Rapids: Zondervan, 2007), Kindle locations 4935-4942. understood as “destruction of all that makes existence desirable.”18 Jeff Spencer, “The Destruction of Hell: Annihilationism Examined” in Christian Apologetics Journal, Volume 1, No.1, Spring 1998, 12. But I am hoping that the reader can see that this response to our reading of Matthew 10:28 does not actually address the exegetical evidence we provide. Since we claim that the context shows that ἀπόλλυμι is being used with the sense of “to kill,” it is pointless for traditionalists to respond that it could mean “to ruin.” If that’s the response, then according to B&K’s own principles of interpretation, it should fail. However, B&K do employ this argument, so I would like to show how it ends up working against them. It has often been pointed out that one cannot simply assume that all shades of meaning of a word are available to the interpreter in every context.19 See Michael J. Gorman, Elements of Biblical Exegesis: A Basic Guide for Students and Ministers, Kindle ed., (Grand Rapids: Baker Publishing Group, 2009), 108; Klein et al, Introduction to Biblical Interpretation, 343; D. A. Carson, Exegetical Fallacies (Grand Rapids: Baker Book House, 1984), 62. This is a fallacy known as illegitimate totality transfer. Glenn Peoples has demonstrated well that the traditionalist argument above is a clear example of this type of logical error.20 Glenn Peoples, “The meaning of “apollumi” in the Synoptic Gospels”, http://www.rethinkinghell.com/2012/10/the-meaning-of-apollumi-in-the-synoptic-gospels. But for the sake of argument let’s assume that it could be established exegetically that ἀπόλλυμι does mean something like “to ruin” in Matthew 10:28. We would still need to explain why this implies a state where sinners continue to live after being “ruined” in Gehenna. B&K follow a typical traditionalist argument by pointing to the use of ἀπόλλυμι in Matthew 9:17, where burst wineskins “no longer function because they have holes in them.” Since they give no attention to context in their article, it appears that they have missed the full force of the Greek verb ῥήγνυμι (translated “burst”) when used in the passive voice as it is here. Instead of supplying an image of leaky wineskins, it carries the idea of being shredded or torn into pieces (c.f. Matt 7:6). The wineskins no longer function to carry wine because they are utterly ruined. One of the principle functions of human life is human consciousness, which one would expect to be “no longer function” if people were to be “ruined” just like wineskins are ruined when they burst open. B&K give other examples too, a destroyed house and death by cancer, which speak very much to this point. Although elements of the original house or person may remain, they each are in such a state of “ruin” that we cannot say in any meaningful way that they still function as a house or person. As John Stackhouse Jr. explains:21 John Stackhouse Jr., “Terminal Punishment” in Four Views of Hell, 2nd ed. Kindle ed. (Grand Rapids: Zondervan, 2016), 59. …extinction: the thing destroyed is gone; the thing that has died is gone. There may indeed be “remains,” but no one considers those to be equivalent to the thing that used to be there, nor is there anything to be salvaged. The true essence of the thing has vanished, whatever happens to remain. Arguing that ἀπόλλυμι can mean “to ruin” in the sense that objects “cease to be useful or to exist in their original, intended state” simply fails to provide a way for traditionalists to avoid the implications of a text like Matthew 10:28. One other lexical meaning of ἀπόλλυμι cited by traditionalists is the use of that word in Luke 15:9 where it is used of a coin that is said in English to be “lost.” Again, I am forced to point out that B&K uncritically present an old traditionalist observation without providing any contextual analysis to demonstrate that “to lose” should pertain to a text like Matthew 10:28.22 See D. A. Carson, The Gagging of God: Christianity Confronts Pluralism, Kindle ed. (Grand Rapids, Michigan, 1996). Carson’s observation is also made several times in Hell Under Fire: Modern Scholarship Reinvents Eternal Punishment, Kindle Edition (Grand Rapids: Zondervan, 2007), passim. If they had compared Luke 15:9 with verses like Matthew 10:39 and 16:25, Mark 8:35, Luke 9:24-25 and 17:24, and John 12:25, they would know that there is a significant difference between losing a material possession like a coin and losing one’s very life. As traditionalist commentators readily point out, Matthew 10:39 quite clearly refers to the loss of physical life.23 C.f. D. A. Carson, Matthew: The Expositor’s Bible Commentary, rev. ed., Kindle ed. (Grand Rapids, Michigan: Zondervan, 2010); Craig L. Blomberg, Matthew: An Exegetical and Theological Exposition of Holy Scripture (Nashville, Tennessee: B & B Publishing Group, 1992), 181; Robert H. Gundry, Commentary on Matthew, Kindle ed. (Grand Rapids, Michigan: Baker Academic, 2011). There is some debate over whether losing one’s life in the first half of Matthew 10:39 refers to a lifestyle of self-denial or to the physical loss of life. The first option is certainly plausible given the immediate context where vs 37-38 are read as a call to this kind of lifestyle. However, given chapter 10 has already indicated that persecution will result in following Christ (vs 16-25) and there will be strife among family members (vs 34-36) it is impossible to rule out martyrdom even if that includes an ascetic lifestyle. In other words, the best we can do is argue for a both-and reading rather than an either-or reading where death is excluded from the picture. So, given that there is germane contextual evidence for our understanding of Matthew 10:28’s usage of ἀπόλλυμι as “destroy” in the plain sense, it remains incumbent on the traditionalist to explain more directly why they think our exegesis isn’t sound. In the final analysis, if we were to follow B&Ks arguments we would be forced to import the idea of ongoing life into a verb that is consistently used by Matthew to speak of the act of killing people. To read Matthew 10:28 that way should require compelling exegetical evidence, but since as I have shown there is no such evidence, the challenge remains for traditionalists to demonstrate from its context why the conditionalist reading is wrong. Given B&K’s appeals to contextual interpretation, it is remiss of them not to have treated this. Instead they only argued from polyvalence (multiple meanings of words). This is not the only instance where B&K simply fail to engage with conditionalist exegesis. In their discussion of 2 Thessalonians 1:9 they jump to a brief discussion of Isaiah 2:10, but completely ignore important considerations found in Peter Grice’s arguments from context and the follow-up article by William Tanksley Jr. and Ronnie Demler.24 For Peter Grice’s article see “Annihilation in 2 Thessalonians 1:9 (Part 1): Destroyed by the Glory of His Manifest Presence” http://www.rethinkinghell.com/2016/11/annihilation-in-2-thessalonians-19-part-1-destroyed-by-the-glory-of-his-manifest-presence; for William Tanksley Jr. and Ronnie Demler see “Annihilation in 2 Thessalonians 1:9 (Part 2): Separation or Obliteration?—The Present Controversy” http://www.rethinkinghell.com/2016/12/annihilation-in-2-thess-1-9-part-2-separation-or-obliteration. Given their previous insistence on context as the most critical aspect of interpretation I am mystified as to why they did not engage with those arguments provided by Rethinking Hell for 2 Thessalonians 1:9. Their lack of engagement with conditionalists means they misrepresent the conditionalist reading of this important verse. I urge the traditionalist reader of this article to avoid B&K’s error, and engage with the actual exegetical arguments made by Grice, Tanksley Jr., and Demler. In closing, I want to issue a word of caution to my fellow conditionalists who may be tempted to argue that “destruction means destruction,” or “death means death.” To simply argue from a lexical definition of a word like this is to be in danger of ignoring the contexts in which a word is used. I agree with B&K that simply asserting a meaning as if it’s plain opens one up to the charge of taking things out of context. The conditionalist case for hell from the destruction language is still strong, but indulging in cliché assertions may just be met with cliché rejoinders from traditionalists, and the debate goes nowhere. If we are going to convince our traditionalist brothers and sisters that our case is exegetically compelling, we must be prepared to explain this case patiently, repeatedly, and in some depth. I have intentionally focused on Matthew 10:28 to illustrate how this can be achieved. I haven’t had space to cover more–and there is much more to cover from B&K’s article–so I plan to write some follow-up articles discussing other hermeneutical issues with their case. My hope and prayer is that giving some attention to these things will provide a fruitful starting point for efforts to move the debate in a more productive direction. 2. ￪ For an excellent article underpinning my understanding of conditionalism and annihilationism see Peter Grice “‘Conditional Immortality’—What it means and why it’s the best label,” http://www.rethinkinghell.com/about/conditional-immortality. Note also I follow the definition of “annihilationism” as expressed in his article. 4. ￪ William W. Klein, Craig L. Blomberg, and Robert L. Hubbard, Introduction to Biblical Interpretation, 3rd Ed. (Grand Rapids: Zondervan, 2017), 264. 6. ￪ Even then, there are times when words are rare, hapax legomenon (occurring once), or statements are obscure. We simply do not always have enough detail to know exactly what the meaning is in these cases. I still scratch my head over what Paul means by “because of the angels” in 1 Corinthians 11:10. 7. ￪ Klein et al, Introduction to Biblical Interpretation, 299-300. 10. ￪ Clark H. Pinnock, “The Destruction of the Finally Impenitent”, in Rethinking Hell: Readings in Evangelical Conditionalism, Kindle ed. (Eugene, Origen: Cascade Books, 2014), Kindle locations 1572-1575. 11. ￪ John Stott, “Judgement and Hell”, in Rethinking Hell: Readings in Evangelical Conditionalism, Kindle ed. (Eugene, Origen: Cascade Books, 2014), Kindle location 1314 . See also Glenn Andrew Peoples’ article on the Rethinking Hell website for confirmation of this point, http://www.rethinkinghell.com/2012/10/the-meaning-of-apollumi-in-the-synoptic-gospels. 12. ￪ Stott, “Judgement and Hell”, Kindle locations 1318-1319. 13. ￪ Gordon Fee, New Testament Exegesis: A Handbook for Students and Pastors, 3rd ed., Kindle ed. (Westminster John Knox Press: Louisville, Kentucky, 2002), Kindle locations 1846-1905. 14. ￪ “The Case for Conditional Immortality”, in Rethinking Hell: Readings in Evangelical Conditionalism, edited by Christopher Date, Greg Stump and Joshua Anderson, Kindle ed. (Cascade Books, Eugene, Origen), 79. 15. ￪ Edward Fudge, “A Loving Challenge to the Evangelical Church”, in Resurrection, Vol. 93, No. 4, 1990; The Fire That Consumes: A Biblical and Historical Study of the Doctrine of Final Punishment, 3rd ed. Kindle ed. (Eugene, Origen: Cascade Books, 2011). 16. ￪ For a similar argument see Douglas J. Moo. “Paul on Hell”, in Hell Under Fire: Modern Scholarship Reinvents Eternal Punishment, Kindle ed. (Grand Rapids: Zondervan, 2007), Kindle locations 2240-2479. 17. ￪ So J. I. Packer, “Universalism: Will Everyone Ultimately Be Saved?”, in Hell Under Fire: Modern Scholarship Reinvents Eternal Punishment, Kindle ed. (Grand Rapids: Zondervan, 2007), Kindle locations 4935-4942. 18. ￪ Jeff Spencer, “The Destruction of Hell: Annihilationism Examined” in Christian Apologetics Journal, Volume 1, No.1, Spring 1998, 12. 19. ￪ See Michael J. Gorman, Elements of Biblical Exegesis: A Basic Guide for Students and Ministers, Kindle ed., (Grand Rapids: Baker Publishing Group, 2009), 108; Klein et al, Introduction to Biblical Interpretation, 343; D. A. Carson, Exegetical Fallacies (Grand Rapids: Baker Book House, 1984), 62. 20. ￪ Glenn Peoples, “The meaning of “apollumi” in the Synoptic Gospels”, http://www.rethinkinghell.com/2012/10/the-meaning-of-apollumi-in-the-synoptic-gospels. 21. ￪ John Stackhouse Jr., “Terminal Punishment” in Four Views of Hell, 2nd ed. Kindle ed. (Grand Rapids: Zondervan, 2016), 59. 22. ￪ See D. A. Carson, The Gagging of God: Christianity Confronts Pluralism, Kindle ed. (Grand Rapids, Michigan, 1996). Carson’s observation is also made several times in Hell Under Fire: Modern Scholarship Reinvents Eternal Punishment, Kindle Edition (Grand Rapids: Zondervan, 2007), passim. 23. ￪ C.f. D. A. Carson, Matthew: The Expositor’s Bible Commentary, rev. ed., Kindle ed. (Grand Rapids, Michigan: Zondervan, 2010); Craig L. Blomberg, Matthew: An Exegetical and Theological Exposition of Holy Scripture (Nashville, Tennessee: B & B Publishing Group, 1992), 181; Robert H. Gundry, Commentary on Matthew, Kindle ed. (Grand Rapids, Michigan: Baker Academic, 2011). There is some debate over whether losing one’s life in the first half of Matthew 10:39 refers to a lifestyle of self-denial or to the physical loss of life. The first option is certainly plausible given the immediate context where vs 37-38 are read as a call to this kind of lifestyle. However, given chapter 10 has already indicated that persecution will result in following Christ (vs 16-25) and there will be strife among family members (vs 34-36) it is impossible to rule out martyrdom even if that includes an ascetic lifestyle. In other words, the best we can do is argue for a both-and reading rather than an either-or reading where death is excluded from the picture. 24. ￪ For Peter Grice’s article see “Annihilation in 2 Thessalonians 1:9 (Part 1): Destroyed by the Glory of His Manifest Presence” http://www.rethinkinghell.com/2016/11/annihilation-in-2-thessalonians-19-part-1-destroyed-by-the-glory-of-his-manifest-presence; for William Tanksley Jr. and Ronnie Demler see “Annihilation in 2 Thessalonians 1:9 (Part 2): Separation or Obliteration?—The Present Controversy” http://www.rethinkinghell.com/2016/12/annihilation-in-2-thess-1-9-part-2-separation-or-obliteration.